Palm oil is used in baking as an ingredient lubricant, emulsifier, flavor additive, and to impart moisture. 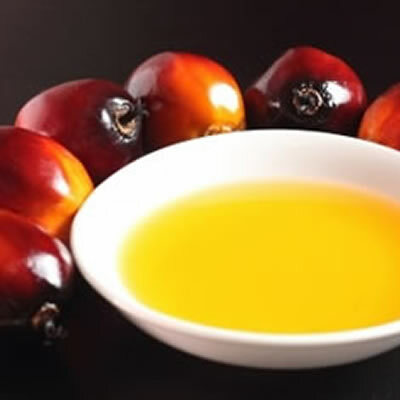 Palm oil is the only vegetable oil with almost 50-50 composition of saturated and unsaturated fatty acids, which makes it act similarly to butter.6 Therefore, it is suitable for confectionery manufacturing without the need for hydrogenation. This oil also has high oxidative stability, contributed by the antioxidants, which leads to a long shelf life. There are also no trans fatty acids: the FDA banned the use of partially hydrogenated oils in 2013. Palm oil is commonly used in cooking oil and margarine to enhance the taste of processed foods. The carotenoid content in the palm oil may perish if it is boiled and become colorless.2 The solid fat profile of is quite close to that of butter and it is therefore highly suitable for use in place of margarine. Mba, Ogan I., Marie-Josée Dumont, and Michael Ngadi. “Palm Oil: Processing, Characterization and Utilization in the Food Industry – A Review.” Food Bioscience 10 (2015): 26-41. Hansen, Sune Balle, et al. “Trends in Global Palm Oil Sustainability Research.” Journal of Cleaner Production, vol. 100, 17 Mar. 2015, pp. 140–149., doi:10.1016/j.jclepro.2015.03.051. Marcus, Jacqueline B. Culinary Nutrition: the Science and Practice of Healthy Cooking. Academic Press/Elsevier, 2013. “Is Your Palm Oil Sustainable? | Blog.” Bakerpedia. 22 Mar. 2017. www.bakerpedia.com/palm-oil-sustainable/ Accessed 14 Apr. 2017. “Roundtable on Sustainable Palm Oil.” Who Is RSPO Tall Infographic-August 2017, July 2017, www.rspo.org/files/download/e8e8b8705359f83. Berger, Kurt G. “Trans-free Fats with the Products of the Oil Palm – a Selective Review.”Czech J. Food Sci. 25.4 (2007): 174-81. O’Sullivan, Maurice G. A Handbook for Sensory and Consumer-Driven New Product Development: Innovative Technologies for the Food and Beverage Industry. Elsevier, 2017. Aini, Idris Nor, and Mat Sahri Miskandar. “Utilization of Palm Oil and Palm Products in Shortenings and Margarines.” European Journal of Lipid Science and Technology 109.4 (2007): 422-32. Odia, Osaretin J. “Palm Oil and the Heart: A Review.” World Journal of Cardiology 7.3 (2015): 144. Chin, Nyuk Ling, et al. “Palm Oil Shortening Effects On Baking Performance Of White Bread.”Journal of Food Process Engineering, vol. 33, no. 3, 2009, pp. 413–433., doi:10.1111/j.1745-4530.2008.00282.x. Cheong, Ling-Zhi, et al. “Baking Performance of Palm Diacylglycerol Bakery Fats and Sensory Evaluation of Baked Products.” European Journal of Lipid Science and Technology, vol. 113, no. 2, 2011, pp. 253–261., doi:10.1002/ejlt.201000296. “CFR – Code of Federal Regulations 21CFR172.861” Accessdata.fda.gov. 01 Apr. 2016.www.accessdata.fda.gov/scripts/cdrh/cfdocs/cfCFR/CFRSearch.cfm?fr=172.861. Accessed 2 May 2018. “CFR – Code of Federal Regulations 21CFR176.210” Accessdata.fda.gov. 01 Apr. 2016.www.accessdata.fda.gov/scripts/cdrh/cfdocs/cfCFR/CFRSearch.cfm?fr=176.210. Accessed 2 May 2018. Can palm oil be reused. I am baking mini donuts with palm oil. How save is it?